Hotshots agreed that last night's Absolut Fusion Party was the best party they had attended in the house. 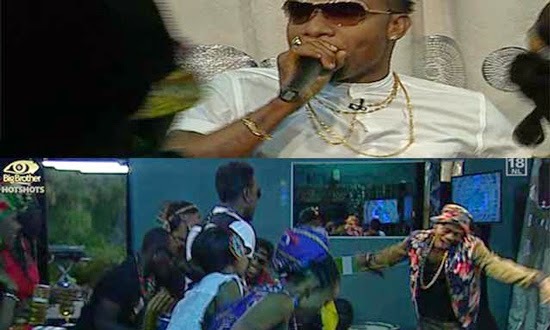 They were raving about it afterwards and loved that Diamond and KCee had stayed on and partied right next to the housemates. Nhlanhla slept through the whole thing and even after his fellow housemates came pouring back into the house after the party he continued snoozing. Eventually, however, he did wake up to talk, dance and drink the night away. It had been an emotional day for Goitse and Tayo, as it was their turn to receive a message from loved ones; but it gave them motivation and the party greatly lifted their spirits as well. Today is time for the Extravaganza yet again and the Hotshots have their work cut out for them. But they've had a lot of guidance and support throughout the week from Fally Ipupa and Diamond Platnumz and we're sure the results will be a reflection of their hard work and passion. It will serve as a welcome distraction from Sunday, which will be the final eviction show before next Sunday's grand finale when we finally see one of the housemates walk away with the title of the ultimate Hotshot. It's been a rollercoaster ride of emotions and next week will be no exception. Make sure you carry on watching to see how they fare during their Extravaganza, who gets evicted and how the remaining housemates cope in the final week in the Big Brother Africa house. Tayo has all it takes to win Tayo has all it takes to win Tayo has all it takes to win Tayo has all it takes to win Tayo has all it takes to win Tayo has all it takes to win Tayo has all it takes to win Tayo has all it takes to win Tayo has all it takes to win Tayo has all it takes to win Tayo has all it takes to win.PLS BIGGIE DNT DO PARTIAL DIS TIME AGAIN OOOO COZ DAT LAST METER IS SUPPOSE TO BE TAYO THE CRAZIEST ND U GAVE IT TO SIPE. That was the bomb!! Thanks biggie proudly Kenyan! !